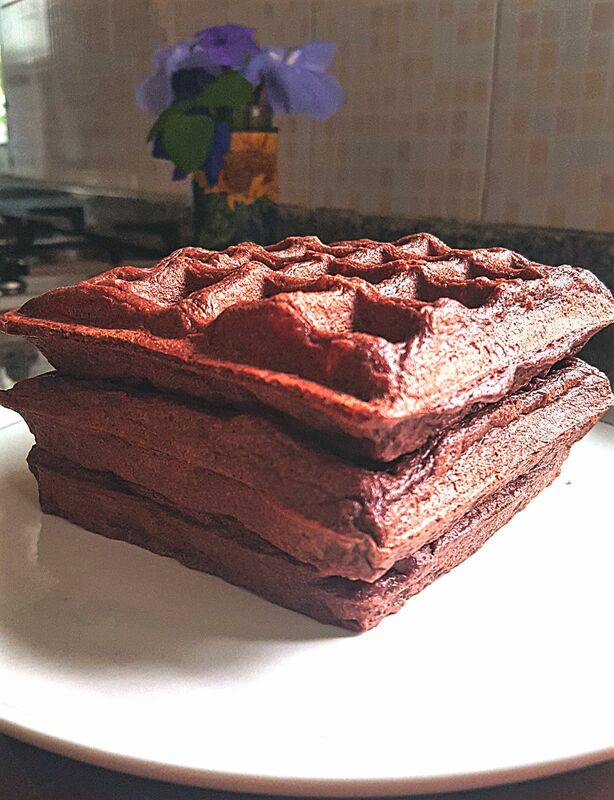 By popular demand, today it’s time for Keto Chocolate Waffles. These beauties are light, fluffy and hold their shape very well. Nothing is worse than making waffles or pancakes that puff up nicely so as to collapse and deflate soon as you take them off the heat. 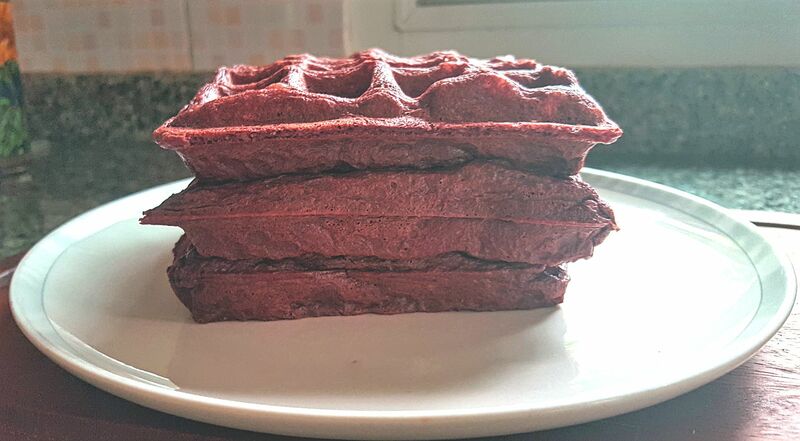 I was very happy with the pancakes recipe from ketobetic aline. It’s our go-to recipe for pancakes. When I tried to add chocolate to make chocolate pancakes, they turned out all right with a few tweaks. But now it’s time to take things up to the next level. 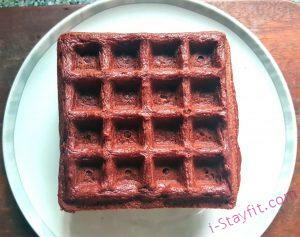 Here let me introduce you to the new kid on the block…Keto Chocolate Waffles. The original batter is usually thick which is perfect for pancakes but when making waffle, it needs to be thinner so that it will spread out and fill the waffle pan evenly. Since we will be adding chocolate as well, we need to add some liquid to get the right consistency and so I opted for coconut oil. One thing I love about waffles is that they are so forgiving. It doesn’t matter how sloppy the recipe, they will always come out looking like waffles. 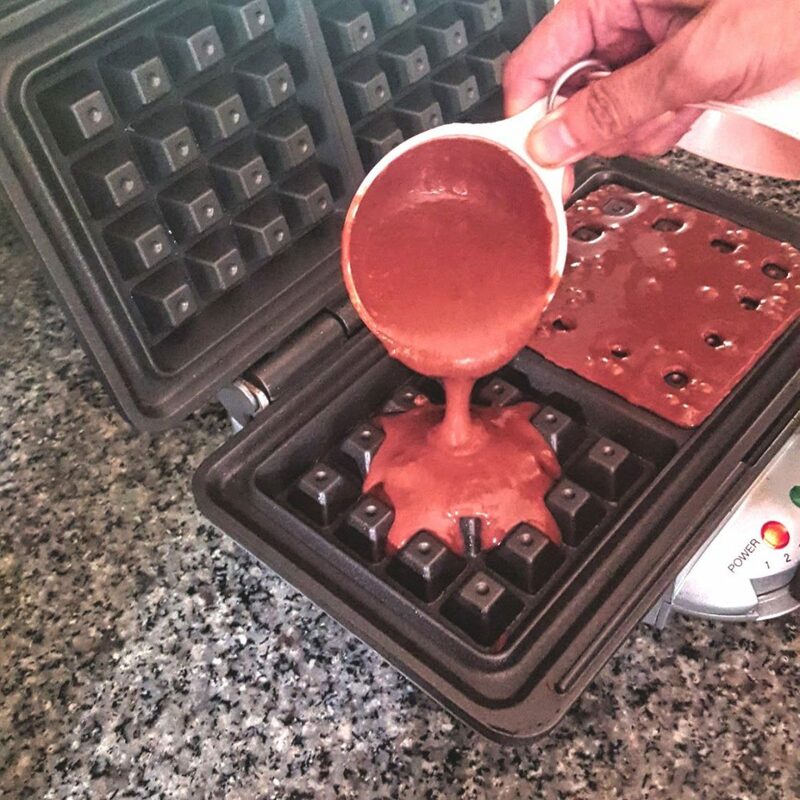 Believe me, I’ve made so many waffles on the fly. I said they all look like waffles but there’s no guarantee if they taste all right. But like they say the proof is in the pudding, as in waffles, ours look good and taste just as good. We used ingredients that are available here. No brand almond flour, homemade coconut flour, Australian cream cheese because we love Australia, the best coconut oil in the world because it’s made in Thailand, English brand baking powder and no-brand baking soda, Van Houten cocoa powder and homemade vanilla extract. You would start with softening the cream cheese by microwaving it for no more than 10-15 secs. You don’t want to cook the cream cheese. Look how soft and creamy it is!! Next we will be adding dry ingredients to the cream cheese all at once. Add coconut oil then mix till you get a wet blob. After that you can add the egg, one at a time. You don’t want to add too much liquid at the same time because the mixture will separate and it will make your life harder trying to get it all well-blended. Sorry the picture is messy. 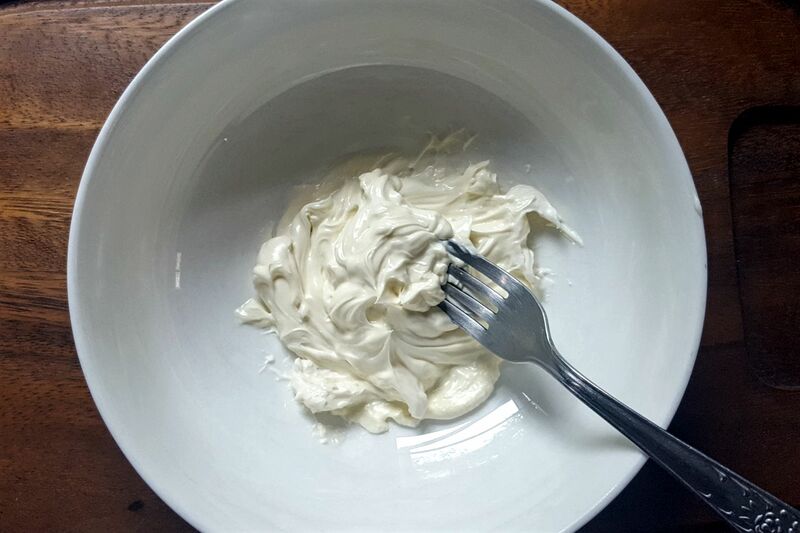 Just want to show what it should look like after you mix the dry ingredients with cream cheese and oil. After this done, it’s all plain sailing. Just add another egg and beat till smooth. The final step is to add liquid sweetener to taste. We used 10 drops of toffee flavored stevia. Powder sweetener can be used without any problem. 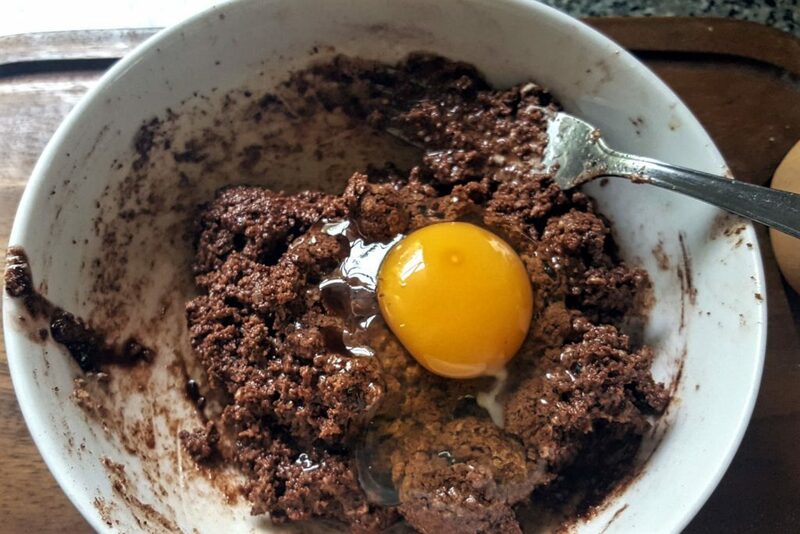 You can see the consistency of the batter…and the bowl is still messy 😙😉If you find your batter is too thick, you can add some liquid to thin it out. Please refer to the note at the end of recipe. Then comes the fun part, cooking it. We have got a Belgian waffle maker which makes thick waffles. The recipe is supposed to make 4 regular waffles but with our machine we can only get 3 full size waffle and a baby one. We set out heat level to number 3 and brush the pan with a little coconut oil. Then use a 1/2 cup measure to fill one side. The mixture will surely start to bubble like this. You got the idea.. And this is what it looks like 90 seconds later. OMG, my house smelled so good all morning. The lingering vanilla and chocolate scent filled up the air. You could smell it from upstairs. We serve our waffles with thickened cream mix with protein powder, which tastes like pouring custard. Recipe is included here too. 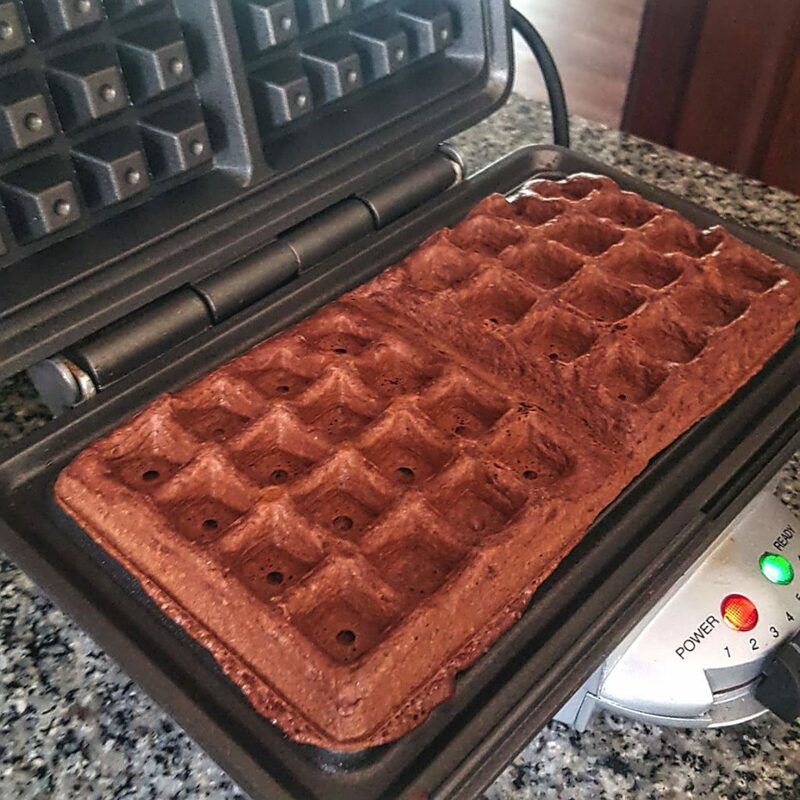 Preheat waffle maker at medium. Put cream cheese in a bowl and microwave on High for 10 secs jut to soften it. 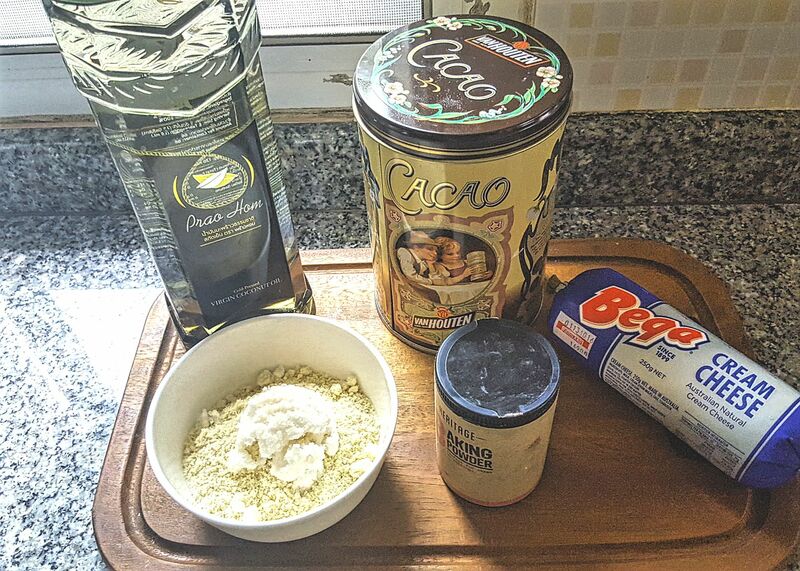 Add dry ingredients: almond flour, coconut flour, cocoa powder, baking powder and baking soda to the cream cheese. Mix together with a fork. You want the cream cheese to blend in with the dry ingredients. This way we can be sure there will be no lumps in our mixture. Add 2 tbs coconut oil and mix well. Add one egg and beat in the mixture then add another egg and beat till smooth. If you prefer, you can use a hand mixer. 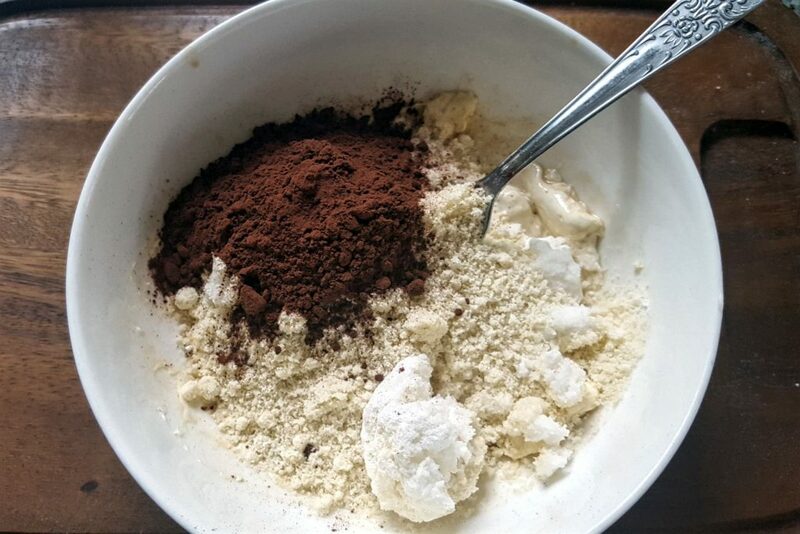 Just put all ingredients in a bowl and mix till the mixture is smooth. 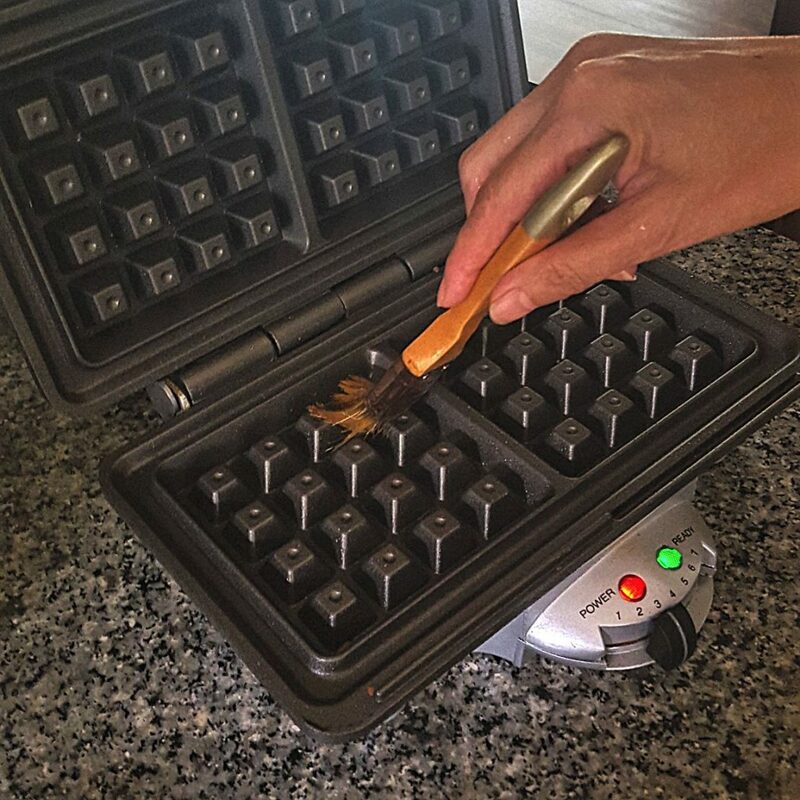 Brush the waffle maker with a little coconut oil. 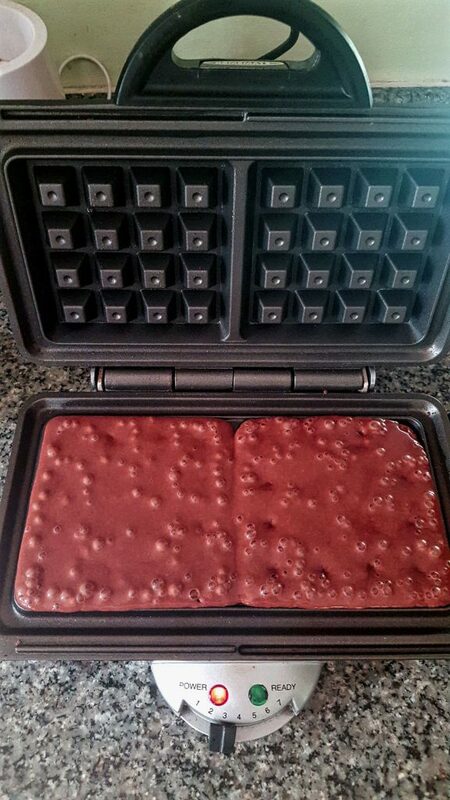 Use a 1/2 cup measure pour in the batter and cook per your waffle maker instructions. Serve with Vanilla Protein Cream Custard. In a small bowl mix together cream and protein powder till smooth. The consistency and color is like custard. Since the weather here is always warm our waffle mixture is rather runny. 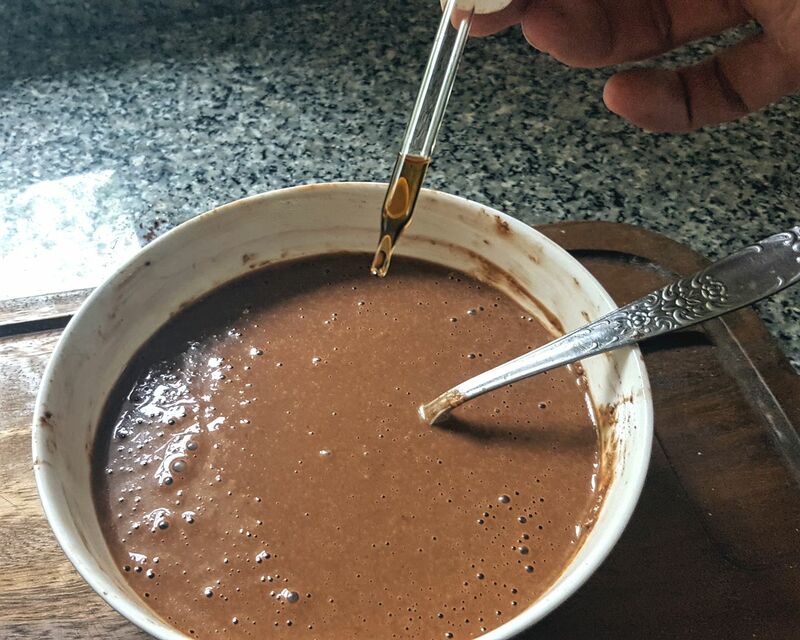 In case that your batter happened to be thick, you can add some liquid to make the mixture pourable. Our friend, Kristin, added 3 tbs of almond milk to her mixture and they came out OK. Thanks Kristin for the suggestions.